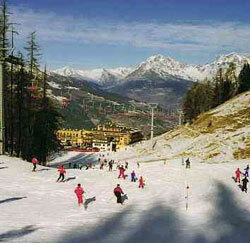 An Alpine valley in the country's mountainous north, Val d'Aosta is bordered by Piedmont, France, and Switzerland. French is spoken as a second language here. Aosta is the least populous Italian region, as well as the smallest; it is the only one without provinces. It has a rather harsh climate, even colder than some parts of western Switzerland. But it is a popular place for winter sports skiers and mountaineers head here and is surrounded by the most beautiful and famous Alpine peaks. There are some remnants of Roman civilization; in the Empire days, the valley was often used by Roman soldiers to get to western and northern Europe. They built roads and bridges as they did so, and evidence of these old structures are still visible today. There are also numerous well-preserved medieval castles. The architecture of the traditional villages is charming. There is a casino and some other forms of entertainment in St. Vincent.